In these days temperatures have reached for me outrageous 38°C, cooking and baking are a difficult subject around here. So, what is better than a nice mixed salad? Refreshing and nutricious, leaving your palate satisfied and your tummy happy but not heavy. The choice out there is really great, you can choose the base - pasta, rice, couscous, or only vegetables - add whatever else you want - fruit, vegetables, meat, fish. It's up to you to create and invent something delicious. My choice this time was a rice salad as a base, and I added some cheese and prosciutto for protein part, cantaloupe melon for some vitamins, and fresh contrast and colour (yeah, I'm leaving for summer holiday at the seaside and taking some beta-carotene is a must if you want a nice tan). And isn't it just such a nice way to serve it in melon "bowls", whether you are hosting some friends or just making your everyday dinner table a bit more beautiful? I prepared only half of the quantity and managed to have lunch two days in a row. Cantaloupe melons are a good source of potassium, Vitamin A (169 μg per 100g), Vitamin C (36.7 mg per 100g), and folate. The potassium is helpful in preventing kidney stones and cantaloupes in general are a useful laxative. They are a source of polyphenol antioxidants, chemicals which are known to provide certain health benefits to the cardiovascular system and immune system. These chemicals are known to up regulate the formation of nitric oxide, a key chemical in promoting health of the endothelium and prevention of heart attacks. It's 90% water, so 100 g = 30 kcal. Boil rice in salted water until al dente. Drain and cool under cold running water. Spread on a clean kitchen towel to dry. 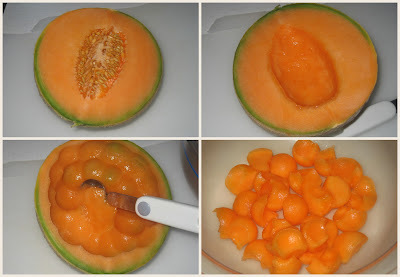 Cut melons in half, remove seeds with a spoon, scoop the flesh and place in a bowl. Put the melon shells aside for later. Wash, dry and cut into tiny stripes the mint leaves. Dice the cheese into 1/2 cm (1/5") cubes. 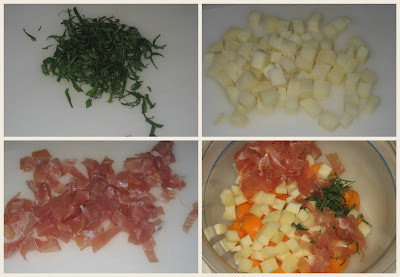 Cut the sliced prosciutto into 1cm large stripes. Add everything into the bowl with melon. Add the rice as well, season with EVOO, salt and pepper, and stir well. Portate a ebolizione abbondante acqua in una pentola, aggiungete una manciatina di sale e lessate il riso. Scolatelo al dente, raffreddatelo sotto il getto dell'acqua fredda corrente e stendetelo ad asciugare su un telo. Tagliate i meloni a metà ed eliminate i semi e i filamenti, aiutandovi con un cucchiaio. Prelevate con uno scavino la polpa e trasferitela man mano in una terrina. Tenete da parte i mezzi meloni svuotati. Lavate e asciugate 10-12 foglie di menta e tagliatele a listarelle. Riducete il provolone a dadini di 1/2 cm circa di lato. Tagliate il prosciutto crudo a striscioline di 1 cm nell senso della largezza. Mettete tutti gli ingredienti nella terrina con la polpa di melone e mescolate. Aggiungete anche il riso ben asciutto, condite con 3-4 cucchiai di olio, sale e pepe e mescolate. Riempite i mezzi meloni svuotati con l'insalata di riso e decorate con qualche foglia di menta e servite. Skuhajte rižu u ključaloj slanoj vodi, ocijedite, ohladite pod mlazom hladne vode, pa osušite na čistoj kuhinjskoj krpi ili nekoliko komada kuhinjskog papira. Prerežite dinje na pola, žlicom odstranite sjemenke, pa izdubite meso i stavite u zdjelu. Sačuvajte prazne polovice. Mentu operite, osušite i narežite. Tanke kriške pršuta narežite na trakice širine 1 cm, a sir na kockice stranice 1/2 cm. Pomiješajte sve sastojke u zdjeli s dinjom i dodajte rižu. Začinite s 3-4 žlice djevičanskog maslinovog ulja, posolite i popaprite po ukusu. Napunite prazne polovice dinje salatom i poslužite. ma che bella idea!! l'insalata nel melone!! oltre che bella da vedere deve essere buonissima!! Wow! This looks innovative and delicious! wow, what a beautiful salad!! I love watermelon yet I never thought to add it any types of meat...what a great combo. I love the salty and sweet flavors of this! Really delicious! Have a great vacation! Ooh yummy! I've never had anything like this, but it looks and sounds delicious! What a great idea, such interesting tastes to combine. I never would have thought of this, but it looks absolutely delicious!! wow that's a neat presentation!!!! This sounds so refreshing and delicious. I love how you served it in the canteloupe! This one is so pretty too! I love that you can serve it right inside the melon!